Farm gates on the east coast are about as diverse as you can imagine. The mild east coast climate, clean ocean and fertile soils create an environment where Tasmania’s world-famous produce is grown in abundance—from fresh fruits and award-winning cheeses to premium seafood. Meet growers, farmers and makers to discover the stories behind the region’s sought-after produce and taste, buy and perhaps even cook your own fresh east coast bounty. The Pyengana Dairy Company is found in the genuinely lush Pyengana Valley. Here, you can sample award-winning cheddars, homemade ice creams and creamy, real farm milk (from the happiest cows you’ll find anywhere). A quintessential east coast farm gate experience is at Freycinet Marine Farm, where you can taste freshly shucked Pacific oysters and Tasmanian blue mussels, straight from the sea at the at Coles Bay. Take a tour of the farm (bookings essential) and make your choice from the day’s selection of mussels, oysters, Tasmanian rock lobster and tender, wild caught abalone. No food-lovers’ visit to the east coast is complete without a stop at Kate’s Berry Farm, where you can pick your own berries from November until May, and purchase preserves, dessert wines, berry ice creams and handmade chocolates all year round. Further north, at Scamander, you’ll find more fruit and farm-made jams, chutneys and sauces at Eureka Farm. Markets in Tasmania are often the best place to source truly fresh, organic local produce. At weekly and monthly markets in towns along the east coast you’ll find tables laden with fresh, locally-grown fruits, vegetables, preserves, baked treats and other irresistible produce. Swansea, Coles Bay, Triabunna and St Helens each have regular or seasonal community markets where gourmet treasures await. Check East Coast Tasmania’s What’s On page for the latest listings. East coast providores are a fantastic source of gourmet local produce. Try the East Coast Village Providore at St Helens for some choice morsels, then pack a picnic basket with your favourites, select a superb view and settle in for a lavish wanderer’s lunch. Match fresh east coast seafood, cheeses, fresh fruits and berries and crisp farm produce with the region’s finest cool climate wines for a five star, al fresco food moment. 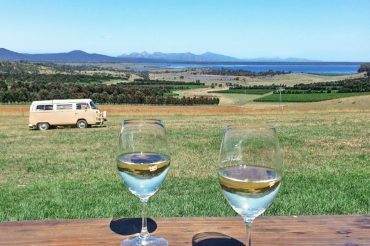 Also, when you’re next visiting Freycinet National Park be sure to check out Providore Wineglass at Freycinet Lodge.